Found one file extension association related to Topaz 3D and 1 file format developed specifically for use with Topaz 3D. Easy for casual users to understand and use. Standard Microsoft Windows interface makes people feel at home right away. Built-in help pages guide them through all functions. Fully interactive, "what-you-see-is-what-you-get" editor. Incredible 3D performance on all machines from powerful workstations right down to laptops with 'integrated' graphics. Powerful editing functions for creating fully texture mapped models. 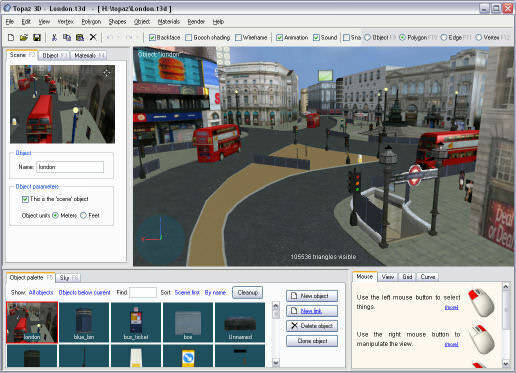 Drag-and-drop building of scenes from existing models - put large scenes together in minutes. Sounds, particle systems and animations bring scenes to life. Create flythrough videos, render images at any resolution. Fully integrated with Google Earth, use Topaz 3D to add models to Google Earth with a couple of mouse clicks. Compatible with a wide range of industry-standard formats. Supplied SDK makes it easy to use Topaz 3D files in your own applications. Standalone viewer makes it easy to deliver final product to clients. No program installation or unzipping is required to view files or real-time walkthroughs - run direct from CD or web. The Topaz 3D software seems to be old or discontinued. If you need more information please contact the developers of Topaz 3D (Topaz 3D), or check out their product website.